Yesterday I wrote an article commenting on the SMH economics editor Ross Gittins’ column about Australia’s foreign debt. What’s that you say? You thought the pollies had done little else but spar about deficits and debt? Sorry, different debt. They’ve been arguing about the public debt – the amount the federal government owes (mainly to Australians). Mr Gittins is apparently claiming that when the Australian Government issues Commonwealth Securities to raise money, that these are mainly bought by Australians – investors, super funds, banks, big companies, etc. But is that true? Is our public debt “mainly” owed to Australians? I decided it might be nice to know for sure. Not just take Ross Gittins’ word for it. 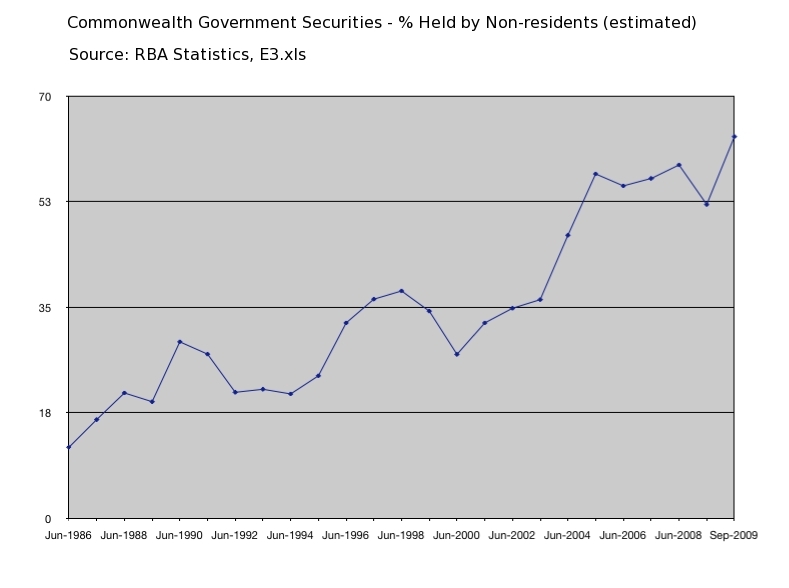 In the RBA’s Statistics section, spreadsheet “E9.xls” – Commonwealth Government Securities Classified By Holder as at June 30, I found something interesting. 73.44% of Commonwealth debt is owned by “Other holders – All other”. That’s at June 30 2009, when there was $101.139bn in public debt on issue. As of Friday, there is now $127.982bn in public debt on issue. Who exactly is “Other holders – All other”? Why does the RBA not release full (and current) details of exactly who owns this vast majority of our public debt? That’s a very comprehensive list. And yet, nearly 3/4’s of the public debt is in that last category. By a simple process of elimination, we can see who does not own the majority of our public debt. So… who is “Other holders – All other”? In a different RBA spreadsheet – “E3.xls”, Commonwealth Government Securities Classified By Holder – we see a category titled “Memo item: Estimated non-resident holders”. This spreadsheet shows that, at September 2009, $65.972bn in Commonwealth debt was estimated to be held by non-residents. From a total of $104.228bn. So at September 2009, an estimated 63.3%. of public debt was actually held by non-residents of Australia. And who exactly, are the ‘non-residents’ who hold 63.3% (or more?) of our public debt? And not just nowadays. Go back to 1997 & you will see that non-residents held a sizeable portion of what was at that time a record amount of outstanding Australian government debt then too. 1997 is interesting, it was the beginning of the Asian Financial Crisis & a sale of a certain commodity by the government. I have put together an article you might be interested in reading or even publishing on your estimable blog? Though it doesn’t necessarily show the Howard government in a favourable light. I’m all ears JMD. No favours needed re Howard Govt; they had plenty of policies I strongly disagreed with. You’re welcome to send your article to acquiredcynicism_at_yahoo_dot_com_dot_au. Thanks for the tip on 1997. I’ll have a deeper dig into that period. It would be interesting to plot the periods of governance by particular parties within politics against the graph showing the increase in ownership of public debt. Who sold out the most? Please i am very very interested in this information! I think you will find it in the archives under ‘RBA gold sale’. For what it’s worth, I think it’s still pretty much on the money, in that I haven’t yet found a better explanation. The RBA has recently been providing some interesting new information on the makeup of its State government bond purchases. I’ve made a graph you might like to see. Pretty clear which state is the biggest deadbeat! I no longer have your email. Send it through to me if you want to take a look. most our debt is hidden it is to the world bank, but govt only tell us of the national debt not our world debt, and in older days they used to disclose our world bank debt….we just raised our debt borrowing limit by a huge $200 billion, huge, this when borrowed will be borrowed from world bank and interest set, did we hear what its for in the budget? NO. Also CIA factbook shows ~ -61% NIIP ie we only own about 1/3 of our farm…. If you have another look….you’ll notice that the RBA has changed the spreadsheet so as to not identify all the groups in detail. Keen professes to “prefer to resolve them (debates) by the empirical record”, then proceeds to extensively quote some guy from the IMF as ’empirical evidence’. I’m skeptical to say the least. He also claims, again quoting the guy from the IMF, that “most of the times when gold played a major role in currency, it was because it had been nominated as the form of money by the sovereign”. Well, so does the dollar, is he claiming the dollar is thus not money? “intrinsic qualities of the metals” is mentioned (again as a quote from the IMF) but evidently goes over Keen’s head. It is just the ‘intrinsic qualities of the metals’ that makes them the premier standard of quality, the regulator of the quality of the credit he is so enamoured of. I am presently reading David Graeber’s “Debt: The First 5,000 Years” – I see Steve Keen mentions it in his piece. It is quite an eye opener on a number of points regarding “money”, debt/credit systems, coinage, and the like. Tends to confirm the view that we are all, in varying degrees, blind to the actual history and chronology of the past systems of exchange used in societies around the world, and their (varying) influence on and relevance to the present. Well worth a read. For my part, Graeber’s book has, from what I’ve read to date (8 chapters), provided abundant confirmation that my own idea for an alternate currency system is, from a philosophical standpoint, right on the money (pun intended). FWIW, I’m naturally very leery of anything put forward by the IMF. In my view, the IMF’s own historical record is abundant testimony to the wisdom of distrusting them and everything they say or do, completely. That’s not to say that everything they say is false, just that one can be certain they have an ulterior motive for whatever they do say, whether true or false; a motive that inevitably turns out to be bad for everyone except them and their cronies. I am in my 60’s and have worked physically hard in hard work jobs al my life and have managed to pay off my home back to a lender. No one really admits who is holding the debt, if I owe a debt it is to a person/bank, that person has money, who in the world has money as such and holds the world debt? No one it is to me, something I have never understood and still can’t in this day and age. Either someone has money and holds a the debt or not, answer please. The banks are the creditors, even though they create your loan out of thin air, as a mere digital entry in their computerised ledger – plus interest on that thin air! Total debt including private, gov and public is around 3.9 trillion. Interesting system we have! Whats the interest Australia is paying! Get rid of the taboo!